Gold metal mesh costume is done! Behind the scenes I’ve been working on the gold metal mesh costume. I just didn’t have the time to take pictures or write about it, on account of being to busy with end of the year recitals, family time, having camp fires in our back yard and playing real life scrabble with my husband as a Dutch version of date night. The scrabble thing is really confusing as the rules are completely different compared to Wordfeud. Now that I confessed that I am one of the three people in the world that still play Wordfeud, this post can’t possible get more embarrassing. Or, if you play Wordfeud too, want to prove that there are more than three people that still play this game and want to play with me, send an invite to Mekyria. Back to the gold mesh costume! The last time I blogged, I had about one third of the belt covered with small gold mesh pieces. It took a bit of times as I have an impressive hip size, which comes in handy being a belly dancer. After I covered the whole belt with gold mesh, I added the closures and sewed a bit of elastic to the upper edge of the belt. It gives it a bit of extra body and prevents the belt from slipping down during shimmies. The good news is that the costume is now wearable as it is, with the belt, bra and skirt fully finished. To celebrate, I decided to go out to a local park and take some pictures. They look good combined with wings. For the future, I’d like to add some upper arm bands in the same fabric and maybe add the left over mesh pieces to the slit of the skirt, to give it some weight. Edging the whole skirt with the mesh pieces might be a bit too much, as the mesh tends to get wrapped up in itself or get stuck on another piece of mesh. To keep it safe, I am storing the bra and belt in a separate bag with a zipper, where I can put both belt and bra in and keep them flat. In all, I am very pleased with how this costume rehab turned out. All I need is an occasion to perform in it and see how it holds up to a fifteen minute routine. My initial plan was to shoot some video material as well, but the wind disagreed and kept blowing my hair in my face, and trying to get my wings. Maybe some other time. I once read a blog about persistance versus perfection. The gist of the blog was that striving for perfection is setting yourself up for failure, while striving for persistance means focusing on continuing your effort in the lobg run. So that’s what I am doing with the gold mesh costume: persistance! I decided to go with a hip wrap type of belt, as it makes the costume wearae with different skirt and sleeve variations. The second reason is that a hip wrap type belt is very accomodating when my measurements change which means less time spent on moving hooks and eyes the days before a performance. 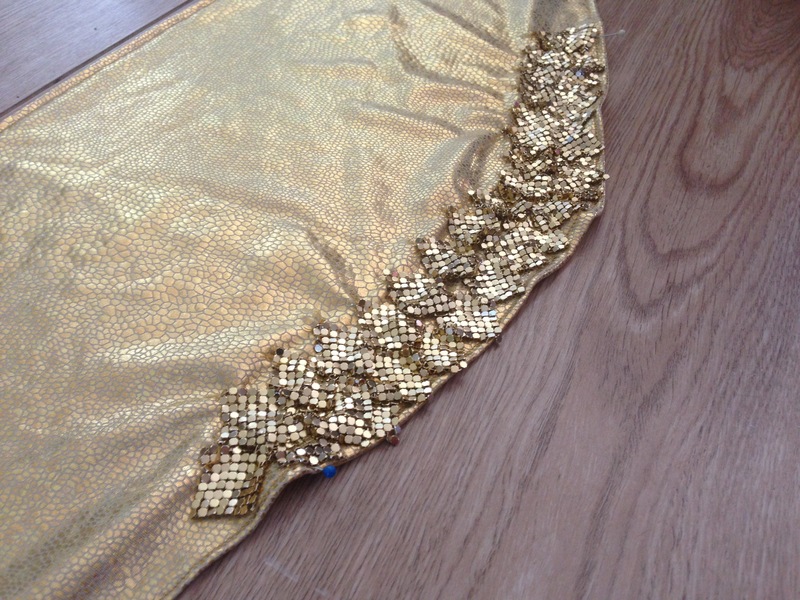 I divided the belt in three and started adding the gold mesh in the middle. The general idea is that finishing a section is motivating me to continue with the next section. Note that my hips are quite wide so this might take a while! Having a focus helps, I try to add five pieces of mesh every day. Once I sit down to sew, I usually get more work done so that is good. At this rate, the belt will be done somewehere at the end of May. It is exciting to look forward to the moment I can wear the costume for a performance! The metal mesh material is easy to work with and covering the bra was quick compared to painstakingly beading a bra with beads and sequins. Due to lack of time it took me a while to cover the whole bra none the less. It does look glorious now and reminds me of a mix between Red Sonja’s chainmail bikini and something from a Mad Max movie. The inside of the cup is marked with the bra size by the seller of the bra base. The Western alphabet is completely different from Arabic script and that’s probably why the c is written backwards 😄. For me a costume isn’t finished without lining. I had a couple of gold satin scraps in my stash from a group costuming project in 2014. Despite my continuing efforts of reducing my fabric stash new stuff gets added because I hate throwing out leftover fabric pieces. In this case I was lucky that the scraps were big enough to line the bra. All it needs is a hook on the shoulder strap and the bra is ready for wear. Huzzah! My next step is deconstructing the skirt. I’m not sure yet if I want to tackle the skirt first or the belt. Creating a seperate belt seemed like a good idea but I can’t setttle on a desig n yet. The gold mesh is unsuitable for overlapping belt pieces so a traditional non stretch belt base is out of the question. However, a stretch belt base wouldn’t look as well in the original shape of the costume. Setting a deadline really helps me to focus and finish projects and I am setting the deadline for this costume on a bellydance party in May. My agenda is pretty full the next couple of months with performances and hafla’s and my maternity leave is almost over. I look forward to teaching bellydance again in a couple of weeks and see what life is like without the company of my newborn 24/7. This is where I get to take everything apart! In order to reuse the mesh, I am deconstructing the bra and removing the beads and pieces of mesh. If the hook and eye closures are in good shape, I will reuse those too. The bra base doesn’t work for me so that one will be thrown out. 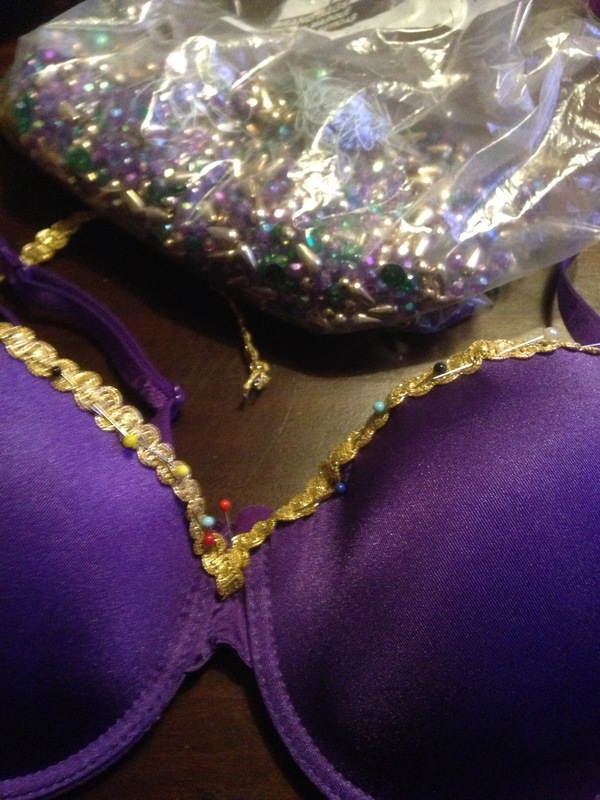 The bra is edges in gold seed beads that are in good shape so I’ll reuse those too. This is what I got to work with for the bra. I’ve covered the Dina bra base with fabric. For the construction I chose to add side straps that are non-stretch so I can add mesh to the sides too. In addition to the non-stretch part, I’m adding elastic covered in fabric to the ends of the straps so the finished bra will be a bit more comfortable to wear and easy to resize while I get back into shape. 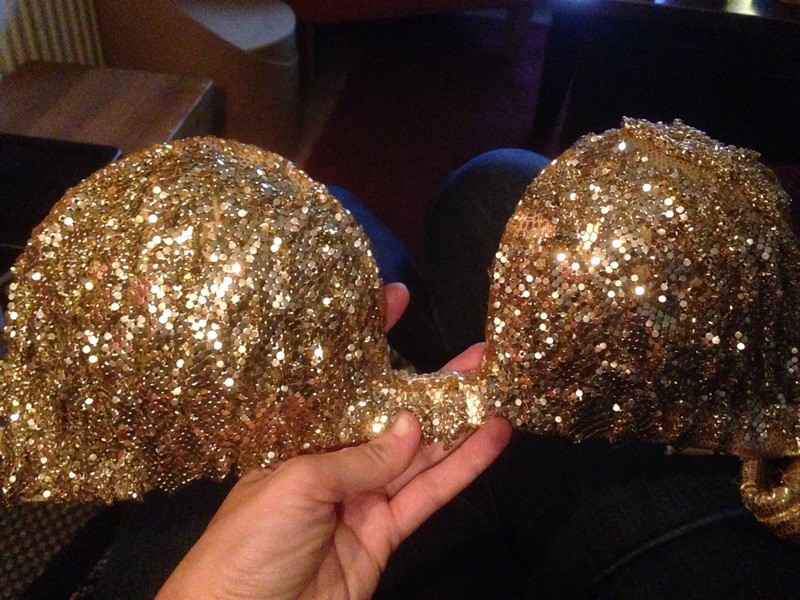 I used the gold beads to edge the bra with a bit of beading, adding an extra bit of sparkle. Back in the days when Facebook wasn’t as popular as it is now, bellydancers would gather on online forums to talk about the latest bellydance cd, what the dancers in Cairo were up to nowadays en to buy and sell costumes. My favorite hang-out was Bhuz. I bought a worn out Eman Zaki costume back in 2010 from a fellow dancer with the intention of refurbishing it. I was fascinated by the use of gold mesh cut into tiny squares and sewn to a lycra skirt and bra. The skirt has a really pretty jagged hemline that flares out nicely when dancing. I found a picture or Randa Kamel wearing this style of costume. Judging by the cup size of my costume, my fixer upper was never worn by her. There are several reason why it needed to be refurbished. The main reason being ‘fabric rot’, the holographic gold print of the base fabric started wearing off. The costume can still be worn but it doesn’t look as sparkly and pretty as it should. Another issue was that the mesh was directly sewn to the skirt: I’d prefer to turn it into a seperate belt and skirt so it would be more versatile. Probably not a v-shapef belt, I was thinking more of a lycra belr with jagged edges. Whenthe costume arrived, I noticed that the bra is on the small side and looks a bit out of proportion for ribcage. This wad new for me as my ribcage is on the small side. I might as well use a bigger bra base to fix it. The bra was kind of dingy, to be expected of a well worn costume. I prefer replacing the lining completely in second hand costumes when they are heavily used, because the sweat is hard to get out of a heavily beaded costume. In this case I’ll create a new bra, belt and skirt so it will be a brand new costume when it’s finished. That’s when I put it into my stash and worked on other things, like organizing a bellydance event, creating the pink Turkish costume and making the pink modern Egyptian costume. 2010 was a very productive year. In 2013, I bought a Dina bra base and searched for suitable fabric online but came up empty handed. I was wrapped up getting better at my day job, dating my future husband (hi sweety! ), buying a house and moving. 2013 was also a very productive year. In the summer of 2015, I found a nice holographic print gold lycra on the local fabric market and I used it for making fast hipscarves for a student recital. I did of course buy way more of the lycra, thinking I could use it for tops, skirts, or other projects. Student group in circle skirts and tie tops. The hipscarves are triangle pieces of lycra. I am a professional bellydancer and costume-a-holic living in the Netherlands. I’ve been sewing and crafting stuff for over twenty years, for theaters, dance costumes, historic costumes and regular clothes. My most recent succesful diy project is our daughter, born in November 2015. If you enjoyed this post and like to be kept in the loop, please like Kyria Bellydance on Facebook or follow me on Twitter. Leave your questions or comments in the box below, or let me know through Facebook and I might write a blog post to answer your costuming question. The black multicolor costume is well on it’s way. 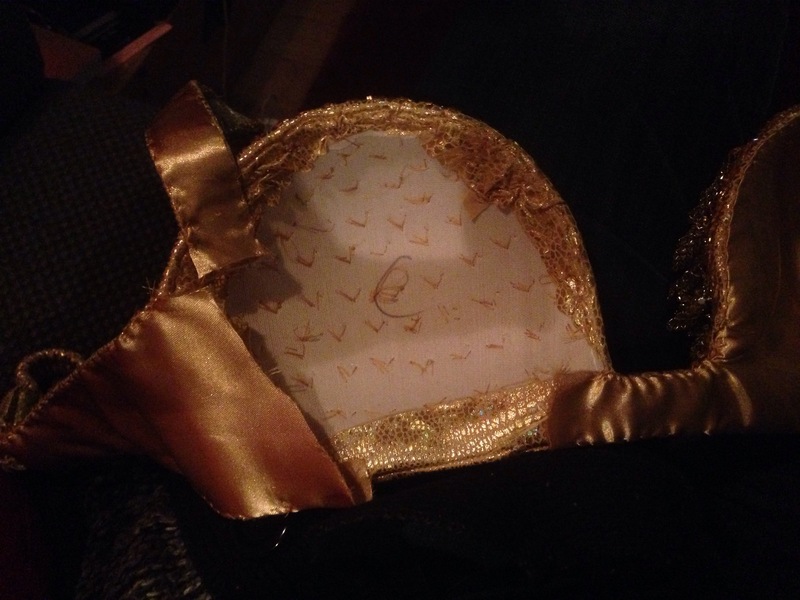 I made a new belt base, a bra base, I decorated the bra and lined it. Before continuing with the belt I needed a short project with a quick result. The key to keeping yourself motivated for complicated sewing projects is by cutting it into smaller chunks. Every time I finish a chunk, I remind myself how I am getting closer to the ultimate goal of creating a completely new costume. So, I decided to work on the matching armbands. The original costume had arm bands made of stretchy sequin ribbon. For the remake I wanted something that mirrored the scallops on the belt and that showcased the bright jewels. I didn’t feel like taking the high road by carefully creating a paper pattern, instead I took a marker and drew the shape of the armbands on white felt and cut out two of the same shapes. I covered both shapes with black lycra by pinning the lycra into place and using the sewing machine to stitch it together. I then continued with ading the sequined fabric on top. 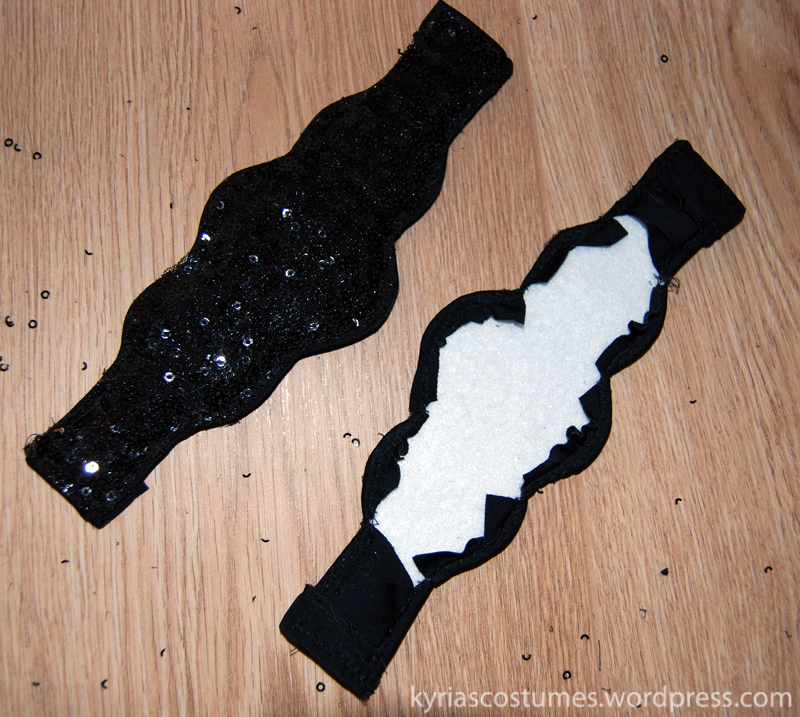 Using a zig zag stitch to attach the fabric to the armbands, I then cut off the remaining sequined fabric. Watch me go crazy by taking this picture on the diagonal instead of horizontal. The beading is similar to the bra: I added rope beading along the edges and stitched jewels edged in pearl in the center of the bands. 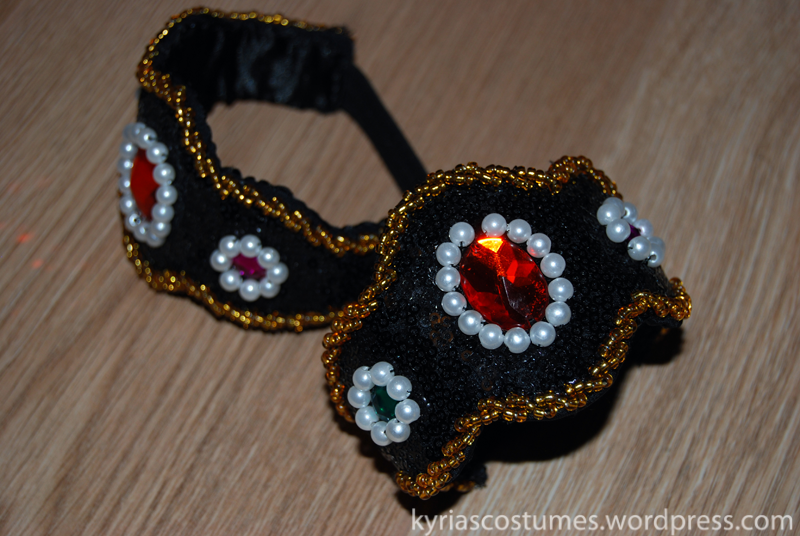 I left the ends of the armbands unbeaded on purpose, to make it easier to attach black elastic. I cut out two pieces of lining big enough to line the arm bands. In order for the fabric to follow the scallops, I needed to make a couple of cuts to create ease in the lining fabric. I made cuts at the places where the fabric might be tense, where the design dents inward. I pinned the lining to the armband with a couple of pins in the center, then started pinning and folding the lining to make it follow the scalloped edges of the design. I started out in the center and worked outwards. As you can see, I am still pinning constently from the outside inward. Consistency in the work proces helps to create consitent quality in the finished product. In other words: once you find out what works for you to create a high quality costume, make sure to stick with it every step of the way. Once pinned, you can already see what the end result will look like. 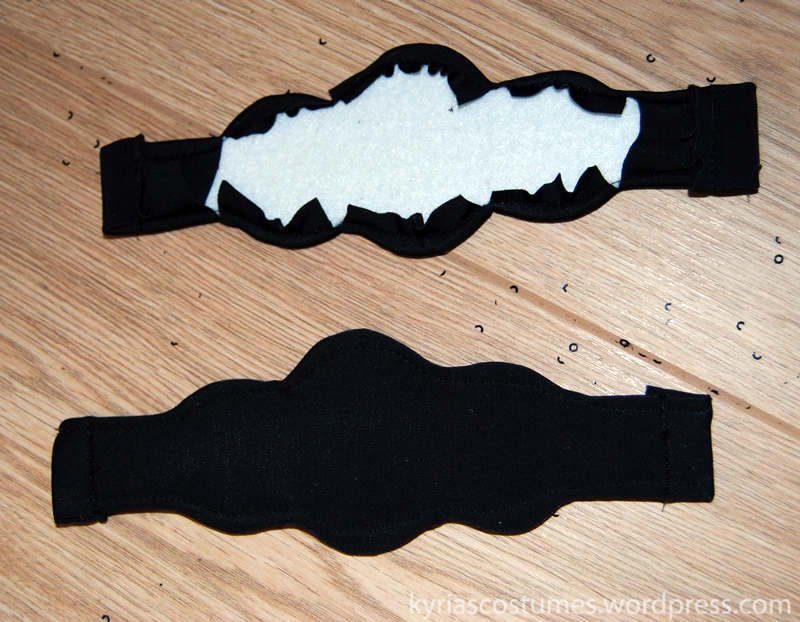 With sewing the lining down, I left the side parts open, leaving a gap for the black elastic. In essence this is not neccesary, the elastic could just as easily be sewn on top of the lining and the arm band would have been fine. I made this choice because I like the look where the edges of the elastic are hidden behind the lining. 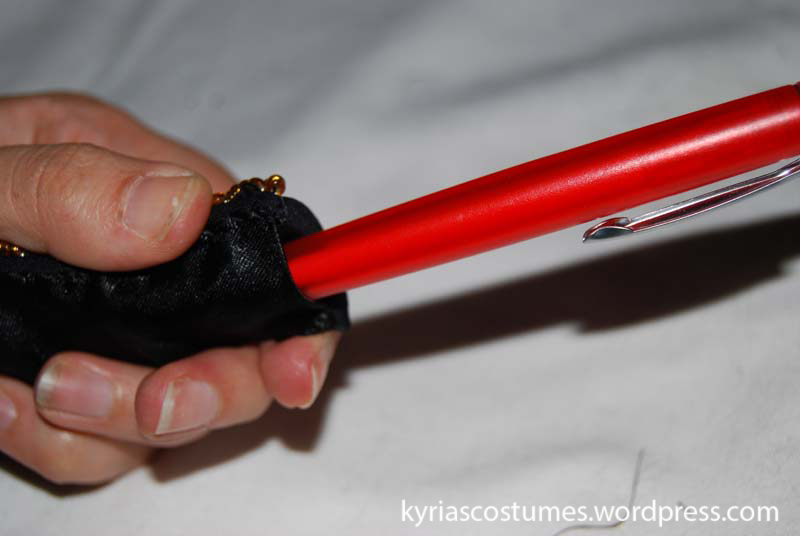 Here I am poking the hole with a pen to show you what it looks like, as black on black was hard to photograph :-). All I needed to do was find a piece of black elastic, shove it between the lining on both side and pin it. I tried it on for size and adjusted the elastic accordingly before stitching it into place. Weehee! I am happy with finishing these and I am continuing with the belt. 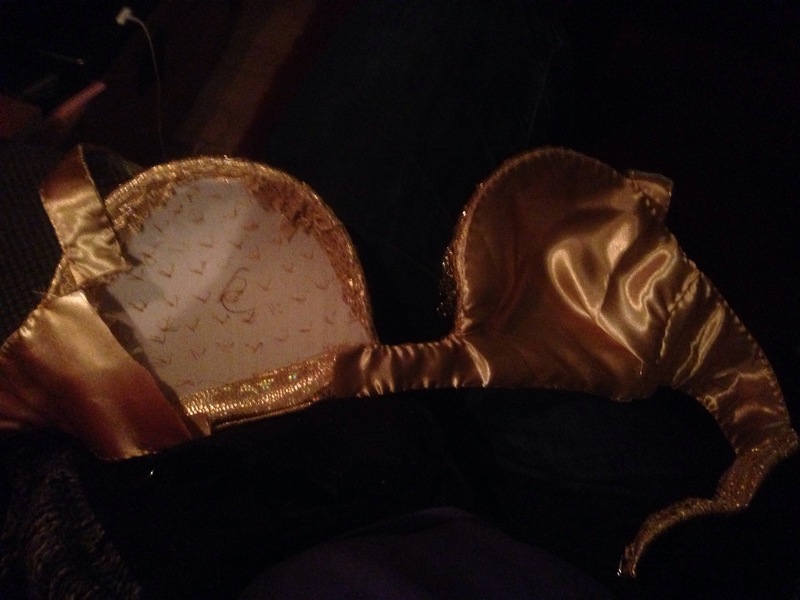 With a shiny new bra base ready to be decorated, it was time to salvage what I could from the original bra. As I suspected, all pearls had to be thrown out because the paint was peeling off the beads. The beaded fringe was in okay shape, here and there a couple of strands had given up and the fringe was a bit loose on the thread with a bit of wiggle room between beads. The gold seed beads were used to bead the shoulder straps and the top edge of the bra but I wanted to bead the whole edge. When I ran out I ordered 3mm gold seed beads from a Dutch website. She was quick with her response and shipping. The beads came in the next day and I was ready to continue. I used a regular rope beading technique, with five beads per stitch. This went insanely fast with 3mm seed beads: I rope beaded the whole edge in two hours. Another reason for using the bigger type of seed beads is that the holes are bigger, making it easier to get your needle through. If given a choice, always go for the bigger seed beads! 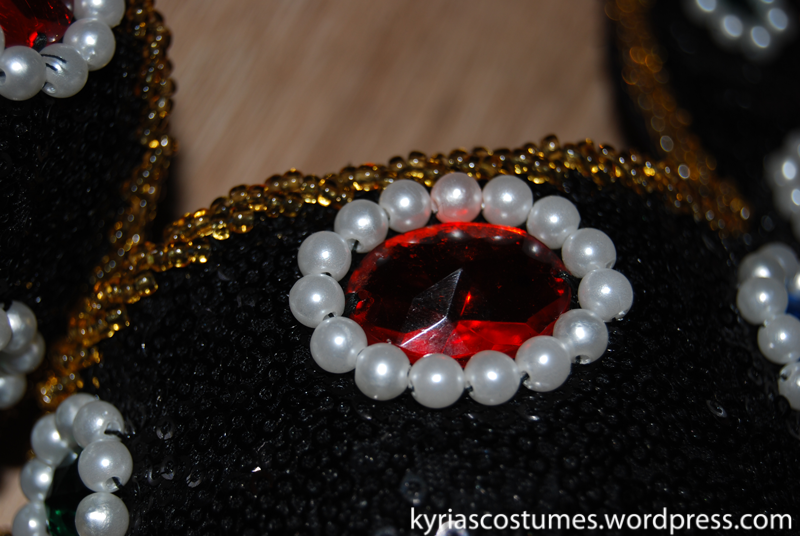 After finishing the rope beading I transfered the acrylic jewels and lined them with new pearls I had lying around. It was already looking rather fetching, if I say so myself. 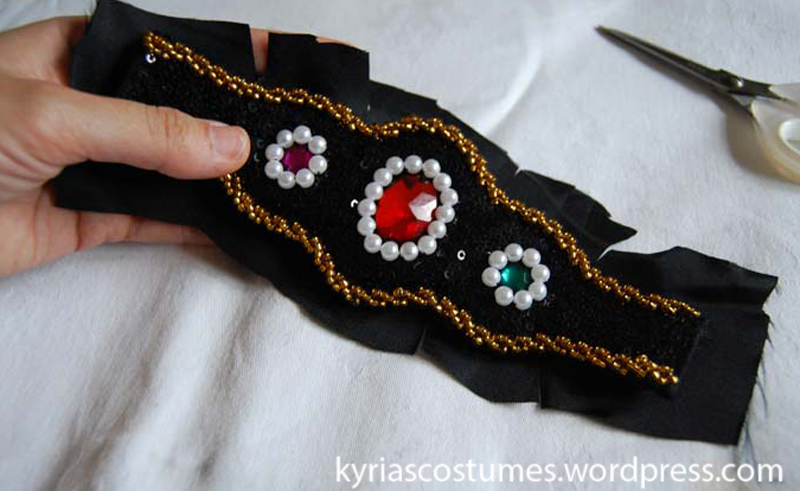 In order to get the pearls neatly around the gems, I stitched them on working from the outside to the inside of the gem, allowing the pearls a bit of room to ‘settle’. I stitched the beaded fringe into place and covered the seam with smaller acrylic jewels and pearls. I am not sure if I want to keep the fringe at this length, or create more of a V-shape by shortening the outside strands on the cup. I will decide later, for now I wanted to finish the bra so I can wear the costume. To make sure that it fitted, I added the hook and eye closure to the sidestraps and pinned the halterstraps together. I have a bit of room for padding, otherwise it fits perfectly. Remember when I wrote about the sequinned fabric not covering the edges? It works, no itching sequins on my skin!